Combine Multiple Lotus Notes Archives by Join or Merge option. NSF Merge Software is facilitates to combine multiple NSF files by Join option. In this feature software will consolidate all the selected files and keeps them as it is in a single folder. This is another way to add NSF files by Merge option. In this process Lotus Notes mail merge tool will merge all the data from folder wise. Folder of one NSF files will unite with folder of other files. 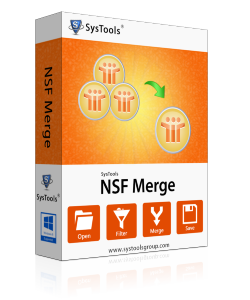 With this NSF Merge Software user have the choice to exclude deleted items at the time of consolidating unlimited NSF files. This helps the user to reduce consuming time & size of outcomes. Tool to consolidate Lotus Notes Archive files will let user to remove duplicate items on the basis of similarity founds in Email header & Dates of sending & receiving items. NSF Merge Application will be Valuable? What makes Lotus Notes Mail Merge Tool made it Exclusive! NSF Merge Application will preserve all the Meta properties of Emails like Internet Header, graphics, fonts and all other attachments. Once you choose Join option software will maintain the folder hierarchy of each Lotus Notes NSF Files. There is no limitation serve by NSF Merge software on the size of Lotus Notes Archive files to get merge. Lotus Notes Mail Merge tool prepares a log report of all the files that are merged or combined. Single pane user interface will let user to merge NSF files with ease. NSF Merge software facilitates users to assign their desired location & name of resultant folder to save the Output. Advantages By Upgrading To Full Version! Wonderful working of NSF Merge software influence me to get flatten for this product. Its efficiency and speed to merge multiple NSF Files are far better than the other products. I must say that NSF Merge tool is brilliant software in order to combine old archive files of Lotus Notes. It is an affordable tool and I would like to recommend others to give a try. I am very grateful to the team who discovers this extraordinary software comes at a very affordable price as compares to others. Thank you team…. From the past few days I was looking for a smart solution that have the capability to consolidate multiple NSF files into a folder as it was a hectic task to manage all the files separately and Lotus Notes Mail Merge Tool have it all.